Previously, I investigated the dynamic mode decomposition (DMD) and the sparsity-promoting dynamic mode decomposition (spDMD). This time I am posting about the multi-resolution DMD – another extension to the DMD, recently developed by Kutz, Fu, and Brunton1. 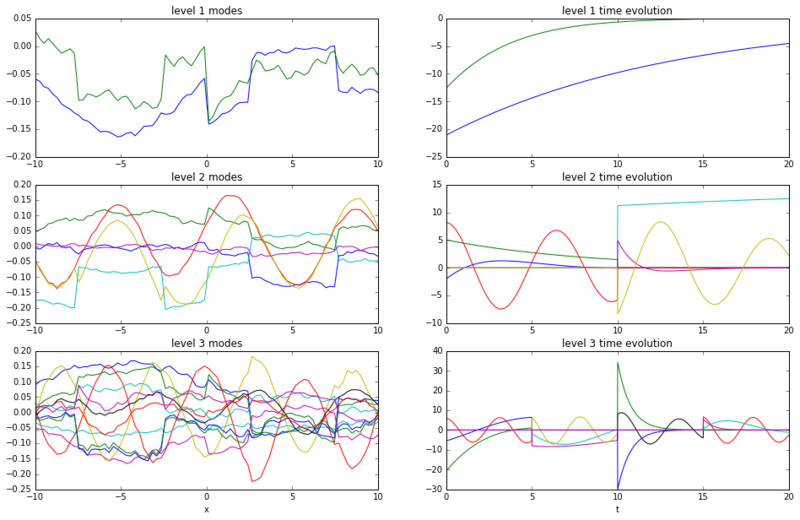 The mrDMD is a very powerful and general method for extracting dynamic structures from time-series data. Its primary strength stems from its ability to identify features at varying time scales. It does so by recursively parsing through the data set, performing the DMD on different subsamples. The resulting output then provides a means to better analyze the underlying dynamics of the data at different scales and to even perform fine-grained predictions. We start by constructing a toy example containing features at multiple time scales, including one-time events. The normal DMD fails to capture some of the features because it is poor at handling “weird” data containing transient phenomena. Then, we summarize the mrDMD procedure and test it on the data. The mrDMD yields a very accurate reconstruction of the data. The code below generates toy data with a single spatial dimension and a time dimension. The data can be thought of as 80 locations or signals (the x-axis) being sampled 1600 times at a constant rate in time (the t-axis). It contains many features at varying time scales. Some are oscillating sines and cosines. Others are unpredictable, one-time events. The data is entirely arbitrary and has no real-world relevance. It is always important to first take a quick look at the data’s singular values. 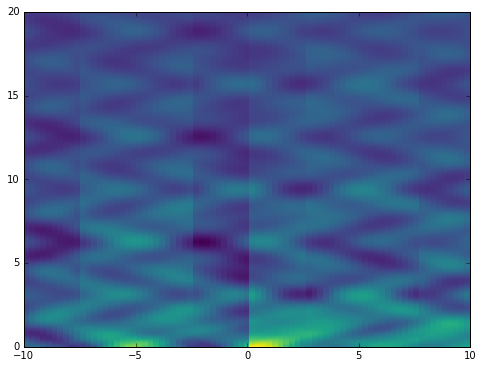 Here we use the optimal SVHT to cut away noise and determine the optimal rank for rank reduction (code copied and simplified from previous post). 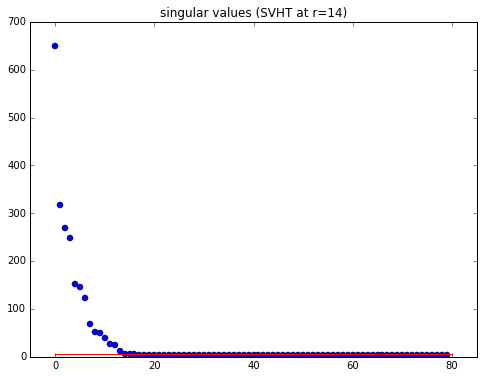 The red line in the singular value plot is the optimal SVHT. Anything above the line, we keep; anything below can be discarded. Here I’m declaring the dmd method originally derived in my post on the DMD in Python. Now let’s compute the DMD. After that, compute the time evolution resulting from initial row of data. Notice that when we plot the reconstruction, it completely fails to approximate the original data! Clearly some features are captured, but transient time events are mostly missing. This is one of the weaknesses of the DMD. My previous post on the DMD shows this idea more concisely. Fortunately, the mrDMD sidesteps this issue completely. Now for a tiny bit of theory. The first main concept to understand is that each DMD mode has a relative frequency and/ or decay rate determined by its eigenvalue $\mu$. One might think of it as the mode’s “speed” – a fast mode oscillates/ grows/ decays rapidly, while a slow mode takes its time. If we recall the form of the equations for the time dynamics of a mode, it becomes clear that a mode’s speed should be proportional to $\lvert\ln(\mu)\rvert$. The exact speed depends entirely on the units of time and how the data is being sampled. So, a mode can be considered “slow” if it has a relatively low frequency or slow growth/ decay rate. This just means that the mode changes somewhat slowly as the system evolves in time. 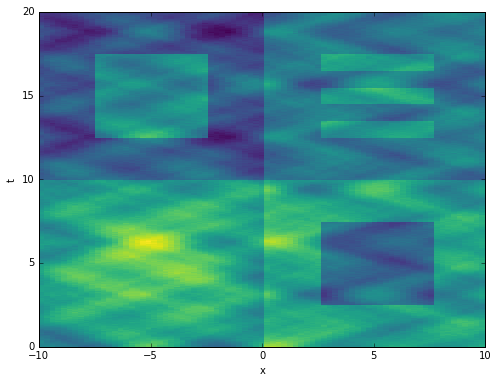 Consider the following plot of logs of the eigenvalues computed earlier. In particular, notice that a dotted circle of arbitrary radius is also plotted to illustrate a possible distinction between “slow” and “fast” modes. 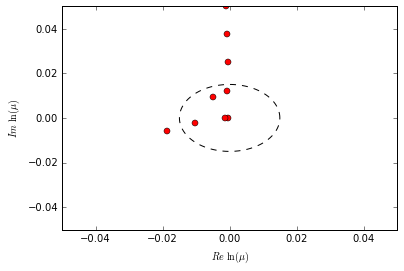 We could potentially decide that all eigenvalues within that circle correspond to slow modes while the rest correspond to fast modes. The reason I mention eigenvalues and mode “speed” is that the mrDMD recursively extracts the “slow” modes at each time scale that it evaluates. What constitutes “slow” or “fast” depends entirely on the eigenvalue in question and what time scale it belongs to. Compute DMD for available data. Determine fast and slow modes. Find the best DMD approximation to the available data constructed from the slow modes only. Subtract off the slow-mode approximation from the available data. Split the available data in half. Repeat the procedure for the first half of data (including this step). Repeat the procedure for the second half of data (including this step). For better execution time, we subsample the data at each level of the recursion. This entails recasting the data such that its new size is the minimum necessary to capture any slow modes. 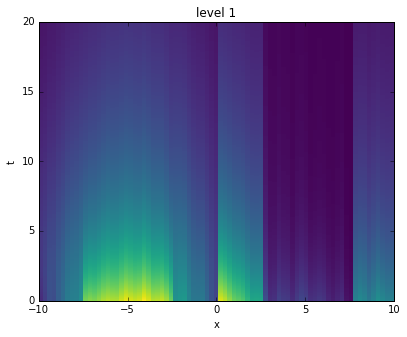 At each level we can perform rank-reduction using the optimal SVHT. Step 3 requires us to compute the “best DMD approximation”. We use the optimal $b$ computation for this step (borrowed from the spDMD2). See my post on the spDMD for more explanation. Once we know the optimal $b$ vector, we can construct a slow-mode approximation to the data. The approximation is then subtracted from the data available at that current level to produce a new data set for the subsequent level. Below is my annotated version of the mrDMD in Python. during the recursion and should not be modified unless you know what you are doing. optimal singular value hard thresholding.""" All that remains is to call the method. The mrdmd method returns a list of “nodes”, each of which corresponds to a particular time scale and time window. The higher the level, the deeper the recursion, the finer the time scale, and the smaller the window. The lowest level only has one time window with a very course time scale (big picture stuff). The higher levels consist of many non-overlapping, smaller time windows (fine details). For analysis, it is useful to “stitch together” all of the many time windows of a given level. With the stitch command, we can extract all of the DMD modes and time evolutions from a given level into a single pair of $\Phi$ and $\Psi$ matrices. For example, here we pull out the $\Phi$ and $\Psi$ matrices from the first, second, and third levels. their plots are below. Notice how the first level modes look like those we’d generate with a single application of the DMD. In contrast, the second and third levels show clear discontinuities at the instants in time where the data was split into two pieces. Note that only three levels are shown because the plots get very busy very quickly. Going a step further, here we recreate the original data by adding levels together. For each level, starting with the first, we construct an approximation to the data at the corresponding time scale. Then, we sequentially add them all together, one on top of another. It is interesting to see how the original data has been broken into features of finer and finer resolution. The power of the mrDMD should be evident. First of all, it is self-contained, with no parameters to tweak – a big plus. Secondly, it allows us to extract features at different levels of resolution, thereby providing a principled way to identify long-, medium-, and short-term trends in data. It is able to cleanly handle transient phenomena and it removes noise without much added effort (especially when using the optimal SVHT). Lastly, it is efficient and general enough that it might be applied successfully in a wide variety disciplines (physics, biology, finance, etc.). The mrDMD is clearly a great addition to the scientist’s toolbox.